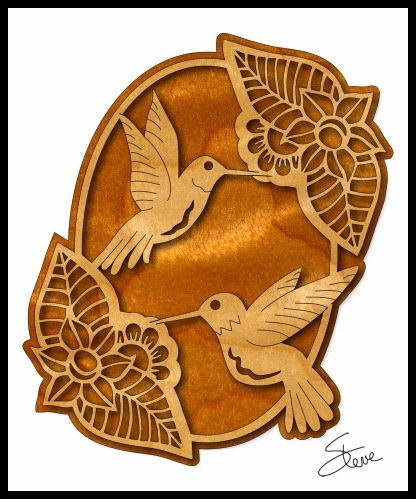 Humming Bird Art Scroll Saw Pattern. Click to watch the video trailer. Your computer will need a DVD player. as a digital file. Email me for details if you need this option. This DVD will teach you everything you need to know to create beautiful wooden portraits. The video tutorial is one hour and thirty minutes. It covers every step of the process. I use a free graphics program (GIMP) that is available for Windows and Mac. I show you where to get the program and install it. 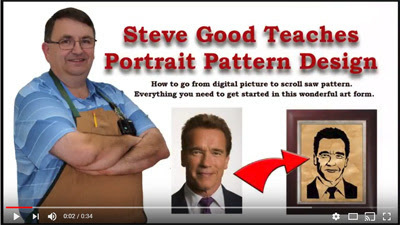 Please understand that I cannot teach basic computer skills in this tutorial. You will need to be able to download and install software on your computer. I will show you how to select a photo that will make a good portrait. We will then go through the process of creating the pattern. After the pattern is finished we will take it to the shop and discuss the techniques of cutting a portrait. This technique can be used on photos other than human portraits. With some practice, you can do pet portraits, landscape and more. My DVD distributor ships to more than 50 countries around the world. International shipping can be slow so expect delays to some parts of the world. US shipping is usually less than two weeks.